One way to add a bit of mystery or interest to an image is to slice it up. Sometimes you might even want to slice it up and rearrange the pieces, but in the spread shown above, I kept them in the same order and simply allowed some of the background to show through. 1. Paint your page or spread a bold color that contrasts with the image you will use. A more subtle look can be obtained by keeping the background color closer to that of the image. 2. If you want your cut up image to be precise, use a transparent ruler and an X-acto knife to slice it apart. It is not necessary to be precise: some wonderful effects can be gained by cutting images up in random sized pieces. 3. In order to achieve precise placement, I adhered the left column and then the top and bottom rows first, filling in carefully with the inside pieces. Add a layer or acrylic medium to the top when the pieces are all in place. It can look *really* interesting if you start to warp the pieces or trade them around! Very interesting effect. It looks like fun too - like doing a puzzle. 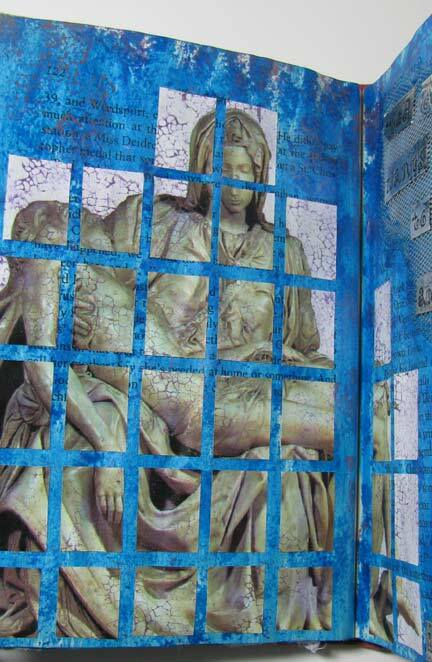 Cyndi, I think I decided what my 1st altered book subject will be. I want to take apart one of my art journals and display/collage all the projects I actually completed into an altered book. I was leafing through it the other day and kept thinking, "Did that one", "Did that one." What a GREAT idea! You could glue the pieces onto pages in your new book, or you could do them as full pages that you attach into the binding with brads, eyelets, or something else.